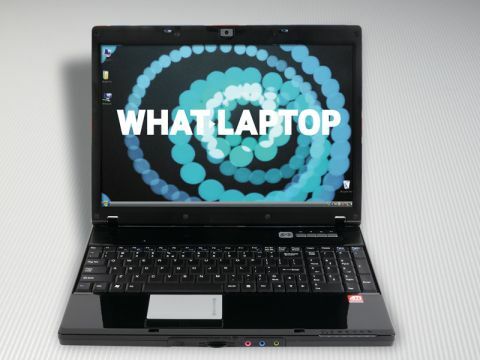 The 15.4-inch Cyberpower Xplorer 80 (£799 inc. VAT) is a semi-portable machine, weighing in at 2.8kg. It uses the same chassis as the NEC Versa P570, but features a slightly more striking design. The most noticeable aspect is its lid, which is fully customisable. Cyberpower will paint it to suit almost any design at no extra cost. The Union Jack on our machine creates a distinctive style, although it won't be to all tastes. The screen offers a Super-TFT coating, with vivid and bright colours. Images aren't as sharp as we'd like, but it's still fine for most uses and DVDs looked particularly good. It reflects a lot more than a standard TFT panel, however, so isn't ideal if you intend to use it on the road. Those wanting to play games will be more than happy with the Xplorer 80, as its powerful ATi Mobility Radeon HD 2600 graphics card offers a great performance. All the applications we tried ran with ease, and gaming proved no problem. The keyboard is quite cramped. You'll find a dedicated numeric pad crammed in alongside the main keyboard, and some cramped keys to accommodate it. This makes it easy to make mistakes when typing. The large touchpad is excellent, but our review machine was let down by poorly attached and unresponsive mouse buttons. Other production models may be fine - but if not, you'll need an external mouse to get the best out of it. This machine offers a sturdy screen surround, and the palm rests felt robust. It did get hot during extended periods of use, however. The Xplorer uses an AMD processor. It's a dual-core solution, and runs at 2.2GHz. We found it was more than quick enough during daily use, booting, running applications and shutting down with minimal lag. The 120GB hard drive is quite small, and will soon fill up if you use it for storing video files. With 802.11n Wi-Fi, Bluetooth and Gigabit Ethernet included, there's no shortage of features. Those wanting to connect an external display can do so using the S-Video, VGA or high-definition HDMI port for outputting HD movies. The integrated media card reader makes it easy to access files from your digital camera or pocket PC, but it's poorly located and tricky to remove the card. Overall, the Cyberpower Xplorer 80 frustrates and pleases in equal measures. It offers outstanding 3D performance and the customisable lid is a nice touch. Quality could be improved, however.